As with all great stories, all must have a beginning and our love of Fenton glass began many years ago. Over the years we have collected, bought, sold and helped start a national Fenton association. With this in mind, we hope to give you an idea of what the Fenton Art Glass Company is all about. In the spring of 1905 Frank L. Fenton and John W. Fenton embarked on an adventure that would become the internationally known and loved Fenton Art Glass Company. During 1905 to 1906 decorating glass purchased from other glass houses would give the Fenton brothers building blocks to move on to much bigger things. In January of 1907, the first Fenton piece of glass came through the lehr of their new factory. This was the giant step forward that they needed to become the Fenton that we know today. Some of the first glass that Fenton made in their new factory was opalescent glass in the colors of amethyst, blue, crystal, green. Opalescent glass would later prove to take its rightful place, as an enduring glass over the coming decades. They would capture the attention of the buying public. Patterns of these early years include Honeycomb & Clover and Water Lily & Cattails. These were a few of their fine examples from the time. Fenton still makes many pieces of opalescent glassware today. Their early opaque glass was done in Chocolate, Custard and Persian Blue. Some of these patterns included: Banded Laurel, Cherry & Scale and also Water Lily & Cattails. The shipping of glass at this time consisted of packing the glass in barrels that had been layered with straw. The destination of the glass was marked on each barrel and then they were loaded on riverboats or trains for their eventual market area. The great American glass houses during the teens were busy making a new and exciting new type of glass. This glass would become what collectors today call Carnival Glass. This early glass was known by many different names from the time like: Egyptian, Golden Sunset, Metalized Art Ware, Radium, Taffida, Venetian Iridescent and Wonder Glassware. Today’s term comes from the fact that at the end of its heyday in the 1920s, some of this glass was given away as premiums at carnivals. Moving through the teens of the last century saw the continuation of carnival glass as a mainstay product. Carnival glass would show some of the finest mould work and colors from Fenton that anyone could hope to find. Some examples of patterns from Fenton’s early carnival production are Butterfly & Berry, Grape & Cable, Orange Tree and Persian Medallion. Carnival with the many vivid colors found on the surface of the glass, has been an allure for collectors over the years. Many other new lines would come from this talented company. Roaring Twenties, with a name like that brings up mental images of hot, exciting and fun days. This glass would be no less exciting than the times. Looking at the change to simple smooth design lines shows us why the use of an iridescent stretch glass finish was a natural on these pieces. The new stretch colors of Aquamarine, Celeste Blue, Tangerine, Topaz Opalescent, Velva Rose and Wisteria would all become future treasures for collectors to find. The use of dolphins as handles on all types of pieces would be another Fenton design which would stand the test of time. None of the dolphin pieces by Fenton or other companies look anything like the dolphin we know today but rather based on the dolphin fish of King Neptune. A personal favorite of ours is the flower stopper or finial, that Fenton used on some of the following items candy box, cologne bottle, perfume bottle and powder box. This delicate adornment has four leaves surrounding five petals that are hand rolled toward the center making a lovely looking flower. This is in our opinion, a true tribute to the mould shop and glass artisans that created it. There were only two other glass companies that used a flower finial and they were Cambridge and Steuben. So either way, whatever piece you find will be a real treasure. Free hand or off hand were two terms used for a form of art glass produced by Fenton from 1925 to 1926. Other American companies produced similar type glass like Durand, Imperial, Steuben and Tiffany. This labor intensive glass was to have a short but important production life at Fenton. European workers came to Fenton and developed this special glass. Unfortunately because of the wage structure that was negotiated for these artisans to make the glass, the cost to Fenton proved to be way too high to make it economical to produce. Hanging Hearts, Hanging Vine, Mosaic and Pulled Feather are some of the patterns of this rare art glass. Some Fenton collectors have never even seen a piece of this in real life. For collectors who own a piece, they should consider themselves lucky. A strong point for Fenton has always been the ability to adapt to what the public wanted. Because of this, the late twenties would give us such exciting items like the September Morn Nymph. This was a two piece figural flower frog, based on the French painting of the same name from artist, Paul Emile Chabas. The September Morn along with the Sunfish and Bulldog are some of the novelty items that were sold at the S. S. Kresge stores. Combining beautiful mold work with colors of Royal Blue or Jade would give customers what they wanted. Royal Blue, what better name could you think of for a dark transparent cobalt color, had such deep rich tones. Jade, another great name for a semi opaque green glass, that is so reminiscent of its name sake, Jade, a semiprecious stone. As the late twenties gave way to a new decade, Fenton was continuing a fine tradition of giving new colors, shapes and items to their lines. Dancing Ladies items with their Art Nouveau style and opaque or transparent colors made them a favorite with customers. The oriental influence is noticed in the colors of Black, Chinese Yellow, Jade, Lilac, Mongolian Green, Mandarin Red, Pekin Blue and Periwinkle Blue. The second way the oriental influence shows up is in the black five legged base. It is very reminiscent of the black painted wooden base found under oriental vases or covered jars. While Cambridge had black dragon decorations on opaque colors, Fenton also did this rare decoration on vases and ginger jars. Note: Fenton’s decoration was painted on, while Cambridge is actually a black encrusted etching. A strong contrast in colors would show through with the use of Jade or Lilac with black. Jumbo, #1618 elephant flower bowl, has always been another favorite of ours. This elephant is seldom seen, but is always a nice surprise when you find one. It is 6.75” tall and 9” long. This massive piece of glass looks much larger than it sounds, when seen in real life. Like other glass companies of the 1930s, Fenton also struggled to obtain sales. For several years Fenton lost money and in other years they barely made a profit. Fenton did everything they could to survive and still keep their employees working. The borrowing of money from several sources along with salary cuts and not making any changes to the plant helped keep Fenton going. The company was on the verge of closing when sales started improving in 1939. The outbreak of World War II cut off the importers from their supply of European glass. They turned to Fenton and other American glass houses to supply them with products. Firms such as AA Importing, Edward P Paul, Jay Wilfred Company and Weil Ceramics all bought from Fenton during the war years and faithfully promised to continue even when the war ended. Of course, those promises did not last long with the end of the war in 1946. They all promptly resumed buying from their old suppliers. Fenton turned back to the Victorian time period for ideas for their glass. Obtaining the Wrisley account was a great boon to Fenton. L. G. Wright had previously produced a Hobnail barber bottle for Wrisley. Fenton was approached about making a perfume bottle based on a smaller version of this bottle. The neck was shortened and the opening was made wider to hold a wooden stopper. This perfume bottle sold extremely well and generated many sales for Fenton. Sales made to Wrisley were one of the big turn around to Fenton’s fortune. Later a powder box and a bath salt jar were developed but it was this perfume that caused the biggest increase to sales. The popularity of the Hobnail pieces to Wrisley caused Fenton to develop other pieces. Hobnail was produced in the pastel opalescent colors of Blue, French, Topaz and Cranberry. Milk Glass was made from 1940 to 1941 and then was discontinued for about ten years. Blue, Rose and Ruby overlay colors moved into the line in 1943. The several crest colors of Blue, Rose, Peach, Ivory, Gold and Silver were all strong selling lines. Fenton, like other glass companies, had a tough time obtaining certain chemicals needed for different colors during the war years. Substitutes frequently had to be made and production schedules altered. Sales during this time were great for Fenton and one of its best customers was the Abels Wasserburg Company of New York. They were a decorating company who bought glass to decorate in their own floral design. These became known as the Charleton Glass. Blanks were also purchased from Duncan Miller, Heisey and Cambridge, thus having the same decoration on different company’s pieces. As the war ended there was still a back log of orders to fill. Coin Dot was the only new pattern introduced in 1947. The opalescent colors used on Coin Dot were Blue, French and Cranberry. A Diamond Lace epergne was an instant hit with its introduction in 1948. Times were starting to change though with imports pouring in and taking away many of Fenton’s sales. Fenton was dealt a severe blow in May 1948 with the death of its founder. A heart attack took the life of Frank L. Fenton and suddenly thrust his two sons into taking over the leadership of the company. The young inexperienced new leaders, Frank M. Fenton and Bill Fenton, both faced numerous problems with declining sales, labor negotiations, sales restructuring and lack of new product lines. Lots of things needed to be done and they could only rely on themselves. First, a new chemist needed to be hired. Isaac Willard was hired after his graduation in 1950 from the University of Pittsburgh. Next up was the sales structure. The Fenton's decided to eliminate the jobbers and to rely exclusively on their company representatives. Incentives were established to increase sales. While Frank L. Fenton had been a designer, neither of his sons was able to fill this type of role. Frank M. Fenton began frequenting antique stores and shows to learn about the different styles. Pieces were purchased with the idea of developing a mould from it or to use as a main idea. The glass may have resembled old patterns, but the colors were distinctly Fenton. An industry wide strike in 1950 caused Fenton to rethink its need for the National Association of Manufacturers of Pressed and Blown Glassware. Things were being forced on the company that had nothing to do with their workers. Fenton followed Fostoria's lead in 1952 and withdrew from the Association. Fenton remained with American Flint Glass Workers Union to negotiate contract talks. With all of these issues finally settled, the Fenton's set out to increase sales. Milk Glass became the new hot color and Opalescent colors in Hobnail were discontinued. Other patterns from the 1920s and 1930s items were revived in milk glass. Cranberry Opalescent in Coin Dot, Rib Optic and Spiral Optic all boosted sales. The Snow Crest items also helped generate more sales. With some changes to its milk glass formula, Fenton over took Westmoreland in the late 1950s and became the top producer of milk glass. As Fenton's sales were increasing, both Heisey and Cambridge were having major difficulties and were forced to close their doors. Both of these companies had heavily depended on their etched lines and the foreign competition was overtaking their sales. Two long time producers of hand made glass were now gone from the American heritage. Paden City had closed several years earlier in 1951 and some of their moulds went to Rubel. These were later purchased by Fenton in 1959. The Cactus pattern, originally from Indiana Tumbler and Goblet Company was reintroduced in Milk Glass and Topaz Opalescent. Topaz color in this pattern did not sell well and was phased out. During this year, Plum Opalescent and Green Opalescent appeared in the Hobnail pattern. These colors brought the 1950s to a close. The start of the 1960s saw a continuation of top selling Milk Glass Hobnail and Silver Crest lines. Other unique crest colors were created for the 1960’s. Apple Blossom had an opaque pink crest. Blue Crest had a bright transparent blue edge that utilized the Colonial blue color already in the line. Flame Crest had a bright transparent orange edge and used the Orange color. The above crests were all applied on milk glass. An important link to Fenton’s future success was the hiring of chemist Charley Goe in September 1960. 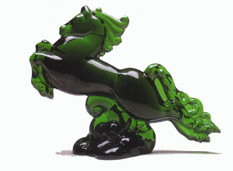 He would be of great benefit to the company because of his ability to create unusual glass formulas. Charley was very fascinated with the glass from the early 1900s and set about trying to replicate them. The various overlays also appeared in the early 1960s. Colors were Amber, Apple Green, Coral, Honey Opaque Blue, Plated Amberina, Powder Blue and Wild Rose. Patterns available were Bubble Optic, Hobnail, Jacqueline, Wavecrest and Wild Rose & Bowknot. Vasa Murrhina was Fenton’s most unique new color of the 1960s. Frank had been intrigued with this old color and had purchased a basket at an antique shop. Chemist Charley Goe was given the task to develop a formula for this type of glass. The steps in making this glass involved rolling opal glass over frit (crushed glass) and then gathering a crystal layer over the top. The glass was then reheated to fuse all the types of glass together. The four colors issued were Autumn Orange, Aventurine Green, Blue Mist and Rose Mist. Thumbprint was introduced in 1962 and most colors continued through the end of the 1960’s. The Rose pattern debuted two years later in 1964 and continued in several different colors until 1976. This pattern was a copy of the pattern made by the United States Glass Company. A year earlier, Fenton had purchased twenty five moulds from this defunct company. Hobnail was also offered in Colonial Amber, Colonial Blue, Colonial Pink and starting in 1962 Colonial Green was added, followed by Orange in 1963. Milk Glass also continued to be a top seller for Fenton. All of these were top sellers for Fenton. Verlys Glass, owned by the Holophane Lighting in America, ceased its operations here in 1951. Heisey leased the moulds in 1955 for a short time. In 1966 Fenton was able to buy all the sixty five Verlys moulds from Holophane with the stipulation that the Verlys name would be removed from all the moulds. From time to time Fenton utilizes these moulds in special treatments. By the middle 1960s, Fenton sales were soaring. During this time Fenton was looking for a new designer and found Tony Rosena, who was at the time employed by Jeannette Glass. In 1967 he was hired to work at Fenton. One of his first successful designs was the versatile Hobnail candle bowl. His Valencia line was developed from a piece Frank had bought at an antique show. At the time Rosena was hired, Fenton was also looking for someone to reset up the decorating department. As luck would have it, Rosena had been acquainted with Louise Piper, who also worked at Jeannette. He highly recommended her to the Fenton. Rosena took her several different Fenton pieces to decorate and brought them back to be looked at. The Fenton's were extremely happy with her work, but Louise wasn’t interested in relocating. Finally in 1968 they convinced her to come and look at the Fenton factory. Once there, they offered her the job again and this time she accepted. Her first decoration was violets painted on Silvercrest, known as Violets in the Snow. This decoration, along with Rosena’s designs was the reasons behind sales increases at the end of the 1960’s. January 1970 saw the debut of Fenton’s Burmese line. For years, chemist Charley Goe had spent time trying to develop a formula for Burmese glass that resembled the early glass from the Mt. Washington Glass Co. This glass was considered one of the most beautiful that Mt. Washington had created. Finally in October 1969, Goe saw the reality of his many long hours of work. When the pieces came out of the lehr that day, they had that desired salmon blush on yellow opaque color. Goe was so excited and proud to know that he had finally got the formula right. Fenton proudly announced they had recreated this treasured glass. Sales soared that first year with customers wanting more. Every piece was marked with the Fenton logo of the word Fenton in an oval circle. In this initial offering, there were six plain and six Maple Leaf decorated pieces in the following shapes: basket, bowl, creamer, one piece fairy light, rose bowl and vase. More Burmese was in the line the following year. That same year, carnival was also reintroduced to the Fenton line after about a fifty year absence. Ten items were in this offering including the 1st annual plate, as part of the Craftsman series. Each plate was to be offered for a year only with the mold being destroyed at the end of the year. This plate series was to depict craftsmen from early America doing their particular type of work. The idea was to produce a plate a year for twelve years. Interest declined in later years and only ten plates were made. Also that year saw Fenton try to capture the limited edition Christmas plate market, by launching their own collection. The Christmas in America series would be a series of twelve annual plates depicting historic churches in America. At the end of each year, the mould for these plates would also be destroyed. The Mothers Day plate series was started the following year with nine annual plates. These three plate series, along with Carnival and Burmese all propelled Fenton through the 1970’s. With the Bicentennial in 1976, it was decided to make some commemorative items with old time glass formulas. The Chocolate and Mandarin Red glass formulas were revived. Along with those two colors, Milk Glass and Cobalt Carnival were also used. For the Bicentennial, the colors were all given special names: Mandarin Red was called Patriot Red, Milk Glass - Valley Forge White and Cobalt Carnival - Independence Blue. Chocolate was included because it had been part of Fenton early history. Rosalene was another color introduced in 1976 that Charley Goe had developed. This color was reminiscent of the early pink slag color. The pink opaque color sold extremely well. The problems came in that it was very corrosive to the melting pots and for this reason the color was eventually discontinued. Frank Fenton had been concerned for some time about preserving the company’s past and had been doing research on the company. He frequented antique shows and shops to find the examples he desired. With the pieces he had accumulated, he felt a need to have a place to display them for all to see and a museum seemed the logical choice. Frank dedicated a lot of time to this project to get it going. Because of lack of land available, the museum was set up in the factory itself, on the second floor. The museum opened in the spring of 1977. As the decade came to a close, Frank stepped down as President in 1978, but stayed on as Chairman of the Board. Bill Fenton assumed the Presidency and continued until 1986 when he turned it over to Frank’s son, George. The 1980’s was to be a decade of struggle for Fenton. Imported gift items were taking a big chunk of sales away from Fenton. While Fenton was struggling to survive, other glass companies such as Imperial, Fostoria, Viking and Westmoreland could not and they closed their doors. The year 1980, was Fenton’s 75th Anniversary. The color, Velva Rose, a pink stretch glass from the 1920s was revived to celebrate this occasion. At this time it was also decided the logo needed updating and an eight was placed under the word Fenton inside the oval. The company was searching for new ways to attract customers. Many different things were tried, some worked but others did not. Private work for Avon, Tiara and Princess House helped to provide extra income. Gracious Touch, a home party line for Fenton was launched and it helped generate interest among new customers. The amount of desired sales didn’t materialize and the line was dropped after several years. For Fenton though, when one door closes another seems to open with a greater opportunity. Home shopping through the TV was generating new sales and Fenton decided to have a go of it. Fenton worked closely with QVC to develop special products for them. Customers really like the informative programs presented by Bill Fenton and heavily bought the Fenton items. This in turn generated interest for more shows which brought more sales. The customers also became more interested in Fenton and came to tour the facility to see where the glass was made. Fenton looked into the limited edition market and brought out the Connoisseur Collection. These select items were offered only in the June supplement. This glass was available in a special type of formula or treatment with a set number of pieces being made. Since that worked, Fenton tried special items for Valentines and Easter. They too proved to be good sellers. So as the decade ended, Fenton was back on solid footing and working to generate increased sales in the future. The new 1990s decade, brought a need to update the logo again. The script Fenton in an oval now had a nine to replace the eight under the Fenton name. Fenton realized the importance of the collectible market and began to take steps to attracting new customers. Special colors and treatments started to be offered in limited issues. Sales grew and thus encouraged Fenton to try more. Beginning in 1993, Fenton offered a new collection called the Family Signature Series. Each of the items is dated with the year and special signature of a particular family member. All of the pieces would reflect the interests of the family member who signed the piece and would be retired on April 30th. Five different pieces were introduced. The Cranberry Rib vase, hand painted with wisteria has President George Fenton’s signature. The Family Signature Series is still continuing. In 1995, Fenton celebrated its 90th Anniversary. For that year Fenton brought back the Celeste Blue Stretch color that had not been offered since the mid 1920s. Fifteen different pieces were offered in the special color. Seven of these pieces were hand painted with a floral design in a Coralene style. This decoration was based on a Victorian technique of using crushed glass as part of the design to create a raised 3D texture effect. Martha Reynolds designed the decoration used on the footed basket bearing the signatures of Bill and Frank Fenton. Jon Saffell came to work for Fenton in 1994. Previously he had been a designer at Fostoria Glass from 1957 until they closed in 1986. Right away Jon set about creating new moulds for Fenton. His focus seemed to be on Christmas designs with the Santa and Nativity. The Nativity set debuted in 1997 with the holy family. Hand painted on opal satin, the set was highlighted with 22K gold to add richness to the look. For the first year of issue only, each set would be marked 1st edition. In 1998 the three wise men were offered. Next in 1999 came the angel, donkey and camel. The set was completed in 2000 with the two shepherds and lamb. There were three different Santa's introduced. One was holding a list, another holding a kitten and the third knelling by a bag of toys. Each year the Santa's are painted different to offer a distinctive new decoration for the Christmas season. Cat lovers took great delight with his new stylized cat. The five inch cat has a very sophisticated look about it. With the new millennium Fenton changed the logo again and replaced the nine under Fenton with a zero. The start of the new century saw Fenton continuing with their tradition of reintroducing old time glass formulas such as Topaz (Vaseline), Florentine Green and variations of the Burmese formula. It has been Fenton’s timeless skill in meeting the wants of today’s consumer, by offering new products and new colors that has enabled this company to flourish. As their count down began towards their 100th Anniversary of being in business, Fenton decided to offer a Centennial Collection. Begun in 2000 and continuing each year until 2005, two family members each year will select a special type of glass that has a personal attraction. Each piece will be numbered and have a Centennial Collection logo. For 2000 Frank choose an epergne in Willow Green Opalescent Carnival and Bill selected a Burmese vase with rose poppies. After a long illness, Bill died in 2002 but he was at least able to see the start of the Centennial collection and have a hand in selecting his special piece. In 2001 Lynn picked a Pink Chiffon ( this color resembles bubble gum) perfume with hand painted flowers and Scott had a hand painted peacock on an Aubergine (a dark transparent purple) vase. For the year 2002, Christine choose a Favrene tobacco jar and Shelley had autumn leaves painted on a Coral Overlay vase. With the death of Don in February 2003, a Favrene vase with a bird on a branch vase was selected to honor him that same year. His brother, Randy, selected a black vase with a tropical bird hand painted on it as his choice. Mike, who loves to design lamps, decided on a hand painted Rosalene lamp for 2004. Brother Tom loves Dave Fetty designs and an elephant figurine was done for him. For the year 2005, George selected a Mosaic vase and Nancy, a Favrene Amphora vase that had a floral design. Fenton held a huge celebration at their factory in 2005 to celebrate their 100 years of existence. Collectors from all across the United States converged on Williamstown, West Virginia for several days of bingo, displays, glass sales, seminars and factory tours. Probably one of the most memorable events, for us, was to participate in the glass making class inside the Fenton factory. We were given the fantastic opportunity to transform molten glass into something. The first part of the class we made a basket and the next part a hanging heart egg. Both of course were much harder to make than you would believe. When you tour the factory, the workers all make it look so easy. While it was a chance of a lifetime to make our own glass, there is no chance we will put any of Fenton’s workers out of a job. The saddest part of 2005 was the death of Frank Fenton after the celebration was over. He did live long enough to see the excitement of all the collectors being at Fenton and I am sure he really enjoyed that. He was truly a great man who inspired many others. The two old time colors of Periwinkle Blue and Chocolate were both recently revived and both of these colors again proved popular. In 2004 Periwinkle Blue was offered in a Historic Collection and was only made for the year in 16 different moulds. Chocolate again made an appearance in the Fenton catalog for 2005. There were 5 different items as part of the Easter collection and sales were limited until May 15. We consider 2007 to be the most monumental year for Fenton. They now have produced glass for 100 years and they are still family owned. Fenton is still here when all of the other glass companies that were in existence when Fenton was founded are gone. This should prove to be an exciting year for family members and collectors alike. A new line called the Horizon Collection has been launched to attract new collectors. There are nine pieces in different types of glass and each is limited to 950. 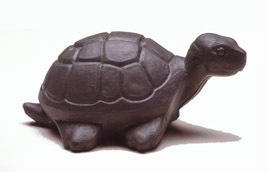 Long time collector favorites of animals, baskets and perfumes are in the 2007 catalog. In addition pieces in Burmese, Heart Optic, Mary Gregory and Rosalene are also being offered. Fourth family generation members of Lynn and Scott are firmly established in making decisions for the future success of the company. Lynn and Scott are both grandchildren of Frank M. Fenton. Scott’s young son, Jackson, a fifth generation member appeared for the first time in a Fenton catalog in 2004. He was showing off the Inspirations collection of Cobalt glass with the words of: “Star Light, Star Bright…. All are precious in his sight” painted on each piece. We look forward to seeing what Fenton will offer in their next 100 years. In celebration of Fenton’s 100th year of glass making, we would like to recommend that you go visit an antique show, antique mall or attend a convention and purchase a special piece from yester year. Likewise, go visit a new Fenton retailer and purchase a special piece from today to ensure Fenton is here tomorrow.